Nelson Mandela inspired all of us with his courage, his unyielding resistance, and his grace. Inspired by Mandela’s vision, climate activists from around the world helped make this video last June during the Global Power Shift convergence organized by 350.org. They tell us it’s impossible to solve the climate crisis. It’s just too big to tackle. It’s impossible to power the world with wind and sun. Wrong! 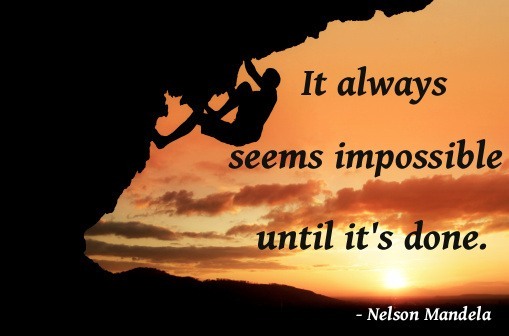 It always seems impossible until it is done. Today, young people all over the world are making the impossible possible. With global communications at our fingertips, we now have the power to connect across continents, culture and religion. Our ability to connect is unlimited. We have the power to challenge governments, corporations, world leaders. We can and will find solutions. Last month we saw celebrations marking 20 years since the release of Nelson Mandela. That historic day signaled a turning point in the path this country was to take; we embarked on a new journey filled with hope for the future. Indeed, there were many who had to pinch themselves when it happened, so bleak were the preceding months and years during which many South Africans saw their country in crisis. The global movement urging action on climate change should take heart from that great event…. It took individual and collective activism and a sense of urgency and responsibility to change our nation. Twenty years later that’s what it will take to change the world.